Weil Knee Walker By Medline: This Innovative Walking Aid Provides A Comfortable Alternative To Crutches And Is Ideal For Below The Knee Injuries. 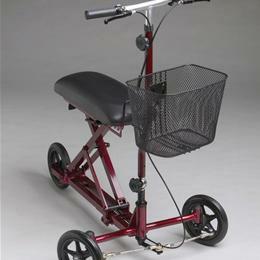 The Three Wheel Design Turns For Easy Use At Home Or Outside. A Thicker Padded Seat Offers Comfort. Comes Equipped With Locking Hand Brakes And A Large Basket. Adjustable Bench Accommodates Heights 4'10" To 6'4". Burgundy.